A regional train plowed into a big-rig truck stopped on the tracks outside the northern Italian city of Turin late Wednesday, killing at least two people and injuring 18, authorities said. Rescuers worked through the night to make sure no passengers were trapped in the wreckage. 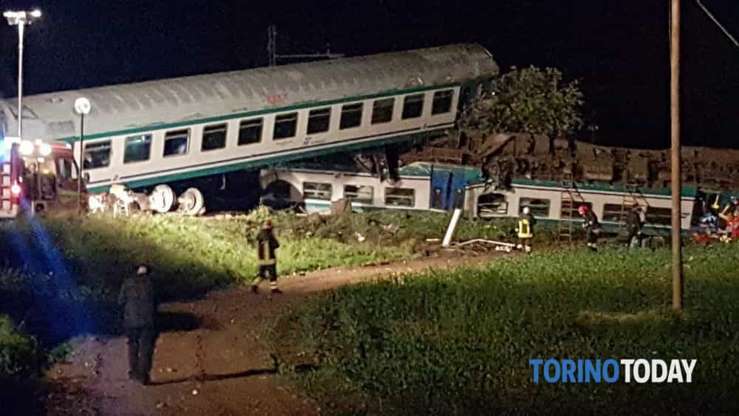 The Italian news agency ANSA said the first fatality was the engineer of the train, which smashed into the truck near the town of Caluso at 11:20 p.m., about 50 minutes after the train began its run from Turin to the suburb of Ivrea. Later, one of two critically injured people who were flown by helicopter to a hospital died, ANSA said. One of the less seriously injured was reported to be a crew member, while the others were passengers. Ambulance dispatches said a total of 18 people were injured, most of them not critically. The truck driver escaped injury, ANSA said. The rig, which carried Lithuania license plates, was headed to a warehouse not far away, ANSA said. The truck's cargo wasn't immediately known. The Rfi regional railroad said the railway barrier had lowered properly before the train's approach but for reasons unknown the truck smashed through the barrier and ended up on the tracks. The crash derailed three train cars. ANSA quoted a young woman who broke her leg in the crash as saying she felt as if she was being pushed from behind, then fell. The passenger, who wasn't identified in the report, said she feared she would die, describing the scene as terrible. Another passenger, 23-year-old Paolo Malgioglio, told the Torino Today news site that after the crash, he saw a scared passenger crouched down in a corner of the car who asked him to hold her hand. She said she had trouble breathing and couldn't feel her legs, he said. "I tried to pull the door open but it was stuck," said Malgioglio, who appeared uninjured. "I really don't know how I made it out like this. I really don't."